FC Halifax Town v Bromley at The MBI Shay Stadium, Halifax. Cameron King for Halifax. 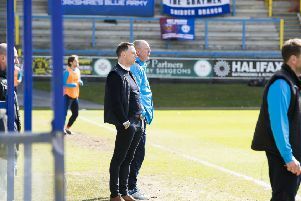 Devante Rodney’s fifth goal in nine games wasn’t enough to help FC Halifax Town to victory as they were twice pegged back to draw 2-2 with Bromley at The Shay. Josh Staunton’s first-half goal was cancelled out after the restart by Josh Coulson, but after Town had roused themselves to regain the lead, Richard Brindley brought the visitors level again as the teams drew 2-2 for the second time this season. It was an up-and-down performance from Town, who had spells of playing second fiddle, but others of sharp attacking play; they took a while to get going, but once they did, they should have won it. Again Rodney was a major positive - any chance Town could keep him Salford? - while Cameron King also demonstrated his growing abilities. But Bromley competed well, and although both their goals were avoidable from Halifax’s point of view, they will feel they did enough to deserve something from the game. The away side broke from an early Halifax corner and reached the hosts’ goal all too quickly, but Brindley could only produce a tame shot straight at Sam Johnson. Dangerman JJ Hooper then burst forward from another Town corner, but was prevented from reaching the box by a superb lunging tackle by Jacob Hanson. Jordan Higgs then sent a vicious shot crashing towards goal that Johnson couldn’t hold, and it was scrambled behind. Town looked a decent threat down their right flank through the pace of Hanson and Rodney, while Cameron King was influential in dictating play for the hosts, spreading it wide and usually being in space to do so. He and Kosylo linked up well, with the latter showing a willingness to run at the visitors’ defence, although an end product was lacking from the hosts. Bromley were what was expected of them, strong at the back, tidy on the ball and well organised. But keeper David Gregory made a howler in the 26th minute when he dropped a Town corner under no pressure, leaving Staunton - who scored in the 2-2 draw at Bromley in September - with a simple close range header. Gregory will need to handle his Easter egg better than that next week. Hooper was slipped in by the lively Brendan Sarpong-Wiredu a few minutes later, but his shot on the turn six yards out was looped over the bar. Sam Johnson then reacted well to hold Coulson’s curling shot away to his left. Centre-back Roger Johnson should have equalised when he met a terrific corner with a far post header, but he inexplicably sent it wide when it looked easier to score. Bromley deserved credit for responding so positively to falling behind, and had carved out far more efforts at goal than The Shaymen by half-time. Halifax had got on the ball in some decent areas, but lacked the quickness of thought or deed to turn that into chances when they reached the Bromley box; if it hadn’t been for Gregory’s gift, Town wouldn’t have had a first-half shot. Halifax had broken well from a Bromley corner at one point, but despite having Kosylo and Rodney ahead of him, Manny Duku, who failed to make much of an impact all afternoon, picked out neither and the chance for a chance went. Matty Brown produced a brave block to deflect Hooper’s shot over the bar from near the penalty spot a few minutes after the interval as Bromley continued to threaten. And they levelled when Coulson’s curling cross from the left went straight into the far corner, as the presence of George Porter on the edge of the six-yard box was enough to leave Sam Johnson in two minds before the ball nestled in the net. Town needed to rouse themselves from their slumber, with the hosts leaden footed and lacking creativity. Bromley weren’t afraid to shoot when they got sight of goal, albeit mostly wastefully, but they at least got much closer to finding the net than their hosts, who were timid, and playing with too much caution for game with nothing but league position riding on it. Halifax finally took Bromley’s lead and brought a good save from Gregory when King let fly from 20 yards. The Shaymen began to play some much better football as the second-half went on, with Rodney cutting in on his left-foot inside the box and bringing a save from Gregory, and a delightful King pass playing Rodney through, only for the striker to be flagged offside. But there was no denying Rodney when he latched onto a loose ball inside the Bromley box, coolly rounded Gregory and slotted home. Rodney should then have sealed it when he pounced on hesitancy in the Bromley defence, but lifted his shot over the bar one-on-one. Bromley then hit the post through Brindley, but he soon found the net with a well-struck low shot from 20 yards after substitute Omar Bugiel had beaten Johnson to the ball and laid it off to his team-mate. Johnson then did brilliantly to tip Hooper’s shot round the post at full-stretch as the visitors came roaring back again. Rodney and substitute Ryan Gondoh could both have won it late on, but both were denied by Gregory. Halifax: Johnson, Hanson, Clarke, Brown, Skarz, Staunton, Berrett, King, Kosylo, Rodney, Duku (Gondoh 66). Subs not used: Rowley, Freedman, Preston, Quigley. 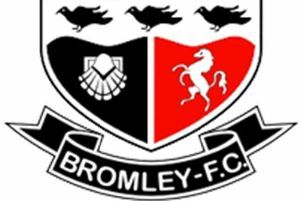 Bromley: Gregory, Brindley, Johnson, Holland, Coulson, Sutherland (Raymond 66), Higgs, Sarpong-Wiredu (Okoye 75), Wood, Porter (Bugiel 70), Hooper. Subs not used: Dunne, Craske.